In my first blog post, The Scouting Report for Link Building Rookies, I discussed the ins and outs of blogger niches for outreach noobs. As a rookie outreacher, my natural curiosity was a HUGE asset when prospecting for potential guest posts and pitching infographics. As time passed, new clients brought new challenges. Guest posting for exact match keywords made outreach life more challenging and I found prospecting to be more difficult. Creating guest posts around keywords like language learning software, toilet paper, and flowers can tough. Especially if you’re trying to stay informative, non-branded, and educate readers. New outreachers tend to give up easily when they run into a roadblock. Good outreachers keep going. Great outreachers accept the challenge and find new tactics to reach goals. What new tactics did I discover? OK. To industry veterans reviews and giveaways are a total “DUH!”. But as an outreach rookie I thought I had struck gold. And if rookie me could see current me, he would know that gold was indeed struck, my friends. When I first pitched the idea of giveaways and reviews it was met with a bit of resistance. Some clients were turned off by the idea. The thought of giving products away that one is in the business of selling can be a tough pill to swallow. Getting product from a client can become a logistic nightmare, or if you’re in-house, getting signoff can be a headache. With the support of my team and using examples of our past work, I got signoff to start my first giveaway. Ever find a blog that’s a great fit but won’t accept a guest post or share an infographic? Pitch the idea of a giveaway. My first real giveaway did way better than I ever imagined and is still one of my best wins to date. I outreached to an awesome blogger in a very particular niche. He turned down my guest post ideas and was too busy for a review, but I didn’t give up. I think the blogger saw a giveaway as a reward to his readers. He said “yes” but he wanted to do a [insert niche brand] giveaway week, not just one measly giveaway post. I got sign off because of the blogger’s strong Domain Authority and active network of readers – comments, shares, and tweets (which are especially important when prospecting for a perfect blog match for a giveaway). I look for blogs that care about content - A strong DA is a good indicator of this. If there is an overwhelming amount of contests/giveaways from networks or blogger programs, it is usually a red flag to me. They’re copy/pasting contest and not adding anything new. Are readers entering, commenting, and sharing the contests? The reward was nearly 300 comments each day for five straight days, plus numerous shares and tweets. And because the blogger was so busy I offered to write the content for each giveaway, including where readers could learn more about each product and purchase if they weren’t the lucky winner – how nice of me, eh? The total outcome included a preview post, five giveaway posts, and five posts announcing each winner and earned the client A LOT of attribution. I was a green outreacher when it came to giveaways, but I got lucky and struck gold. I learned a lot right off the bat about what works and what doesn’t. Offer to help draft up the contest – It really does save time, but don’t get greedy with attribution. Make the giveaway awesome – play Oprah online! A grand prize or a week’s worth of prizes is better than one small prize, BIGGER IS BETTER! Suggest a post prior to the contest to build excitement. If you can, send prizes directly to the winners – it’s much easier. Giveaway/coupon sites – no real value here IMO. Think beyond the link. Use your budget on domains that fit your brand best and will add value. Product reviews are always going to be part of ecommerce and will always have a place online. If you’re dabbling in reviews, be sure to understand Google’s Webmaster Guidelines and FTC regulations. Again, think beyond the link. There are an overwhelming number of sites that participate in reviews. Find ones that fit your brand and create exceptional reviews. Outreaching for reviews is fun because instead of asking for an opportunity (like guest posting), you’re now the one offering the opportunity – the dynamic shifts. Blogger Link Up is not just for guest posts. Submit an offering in the product review section of BLU and have bloggers pitch to you. Submitting to BLU really made my review process more efficient. Instead of prospecting and pitching, bloggers were coming to me with press kits and statistics telling me why I should work with them. Evaluating a list of prospects is much easier than using advance search to find sites that offer reviews. Using SeoMoz’s Open Site Explorer I could quickly evaluate which domains met my minimum criteria and then dive into the details to see if the blogger’s reviews fit my standards. If I was ever unsure I would ask the blogger to send me examples to discover if they were indeed a good fit. Again, I try to work with blogs with a strong DA. I view this as an indicator of quality and as such higher value domains usually earn a larger budget for their reviews. Overall look and feel - This blog will be a reflection of my brand, so does it fit? Look for visual cues, the standards they set in prior posts. You can tell quickly if they just want free stuff. Does the review educate readers on the pros/cons of said product? Is the blogger using actual images in the post? Let Blogger Link Up do your prospecting! 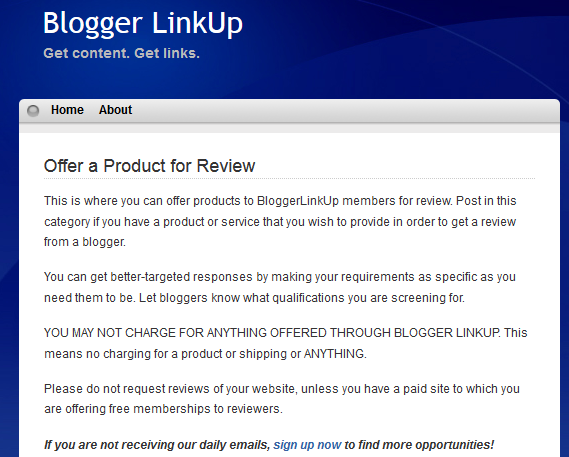 Submit in the ‘product review section’ and have bloggers come to you! Encourage great content – share a review with your blogger to set expectations . Set expectations on time frame of completion before sending out any items. Make sure they are understood and agreed upon. If you can, send products out directly – cut out the middleman. Include branded accessories – If you have branded items like stickers, magnets, trinkets, etc. send them along with your item. Let them know you included them for free, chances are they’ll end up in the images. Is there value in the blogger’s past reviews? – Look for in-depth writing and original images. Blogs with a lack of content or meat to their reviews – If they are not willing to write they are not worth the product. The site does not have original images on their past reviews – That is just plain lazy, run away! I steer clear from bloggers that fill their posts with Amazon affiliate links. If none of the blogger’s reviews fit your standards, chances are that will not change for your review. Whether you’re a link building noob or seasoned veteran, giveaways and reviews are a nice addition to guest posting. Think beyond the link and find domains that fit your brand. If you are strictly thinking about links maybe giveaways and reviews don’t fit your outreach plan. It is important to recognize that giveaways/reviews DO NOT GUARANTEE links. 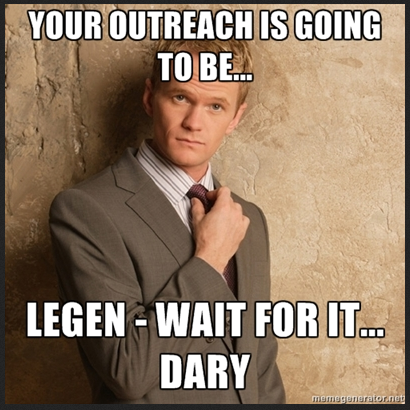 Giveaways/Reviews are a component of a bigger outreach plan.They add value to your brand through awareness. Focus on creating quality relationships with bloggers that fit your brand and the rest will follow. Giveaways can open doors to new blogs. Reviews can create relationships that open doors to new outreach opportunities. Have you had success with reviews? What works for you when running a giveaway? Help an outreach noob by sharing your experience in the comments below.